Tesla has changed the landscape of the automotive industry. Musk, through sheer vision and will, made that happen. Other people certainly could also have done it, but it would have taken longer. The large automotive firms, like Toyota, Daimler-Benz, BMW, GM, Ford, Nissan, all could have started the revolution, but they didn’t. Just like Checker Cabs could have become the Uber, but didn’t. It takes vision and grit to make a revolution happen. Musk had both, the started something unique, he started something big. In the the end, Tesla might not succeed, but the movement will certainly survive and there will be electric vehicles everywhere. In Insane Mode, McKenzie guides us through that revolution and gives us the back story. 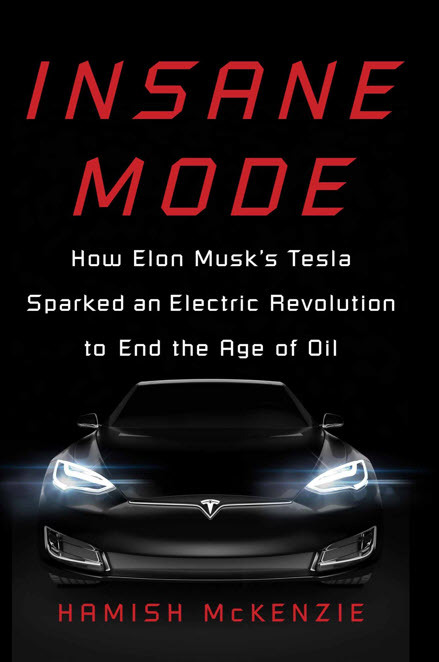 He also shares some of his own thoughts and vision on just what an impactful revolution the electrification of automobiles actually brings, and how much it will change the way we live, work and play. Insane Mode will change the way you think about electric vehicles. If you have an enterprising mind, it will make you ponder where you might apply your own ingenuity in the tremendous opportunities the near future offers.